All parts listed are normally stocked items unless stated otherwise, all prices are recorded in Canadian and US funds. SD Performance refinishes all the rear thrust surfaces on all the Eagle cranks we sell, as we've found many to cause premature thrust bearing failure or excessive wear. 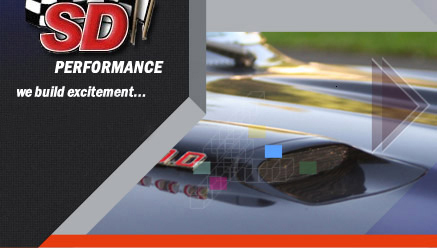 SD Performance has spent an extensive amount of time on the dyno, at the track and on the street to develop some of the best performing Pontiac ported cylinder heads on the market today. All of our heads are flow tested on our state of the art computerized Superflow 600 flowbench equipped with velocity probes, but we’ve learned that what really counts, is how our heads work in the real world. A flowbench is a great tool which we use daily, but there is more to an efficient head than just flow, too many put their faith in flowbench numbers alone.